This project aims to reduce medication errors, by ensuring the patient’s medicines are accurately documented on admission to hospital and any changes are communicated to the patient and carer when they are discharged or transferred to another care provider. To increase medication reconciliation rates at Wollongong Hospital from 40% to 80% within 12 months. Improves patient safety and reduces preventable harm by ensuring a best possible medication history is collected on admission to hospital. Reduces the risk of medication errors and ensures any issues are solved quickly. Engages patients and their carers by including them in discussions about their medication and care. Improves communication about medication changes between clinicians and to patients and their carers. Supports an efficient discharge process. Ensures the hospital maintains National Safety and Quality Health Service (NSQHS) Standards. Improves the patient experience and enhances staff satisfaction. Increases staff awareness and knowledge of medication reconciliation. Global studies have identified that half of all errors associated with medication in hospital occur at admission and discharge1, with up to two thirds of medication histories containing one of more errors2. These errors can put patients at risk of harm by providing suboptimal or unnecessary treatment, causing delays in discharging patients from hospital and potentially increasing readmission rates. Medication reconciliation is a formal process of obtaining and verifying a complete and accurate list of each patient’s current medicines, matching the medicines the patient should be prescribed to those that are actually prescribed. Where there are discrepancies, these are discussed with the prescriber and reasons for the change are documented. When care is transferred (such as between wards, hospitals or home), a current and accurate list of medicines, including any changes that have been made, is provided to the person taking over patient’s care2. Between June and December 2015, Wollongong Hospital recorded an average of four medication reconciliation related incidents per month, with one requiring a significant incident review. Results from the 2015 annual medication safety audit revealed that only 40% of admitted patients had their medicines reconciled within 48 hours of admission. The Hospital Medication Safety Committee recommended that Wollongong Hospital implement a change management project to improve medication reconciliation using a multidisciplinary approach. This aligned to ISLHD objectives of zero harm, better outcomes and satisfactory patient journeys. introduction to medication reconciliation training was delivered to nursing staff in January and February 2017. 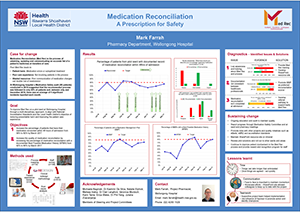 Prior to the project, different clinicians documented information relating to medication reconciliation in different places. The Medication Management Plan (MMP) was used by 95% of pharmacists, but only 10% of doctors and 5% of nurses. To ensure consistency across medical and nursing staff, the MMP was promoted in training to nurses and doctors, as well as included in the medication reconciliation guideline and referral pathway. Process mapping showed that progress or issues relating to medication reconciliation was often not communicated. To address this, an electronic medical record (eMR) referral process was developed in February 2017, to help medical and nursing staff follow up with pharmacists on any medication reconciliation issues. The Geriatric, Surgical, General Medicine, Emergency and Pharmacy Departments at Wollongong Hospital, Illawarra Shoalhaven Local Health District. awareness of medication reconciliation, measured by a staff survey. Persistence and following up on progress is important, as is sponsorship and identifying and engaging with a project champion. Teams should be prepared for constant changes, including medical staff rotations and competing projects. Sullivan C, Gleason KM, Rooney D et al. Medication reconciliation in the acute care setting: opportunity and challenge for nursing. Journal of Nursing Care Quality 2005; 20: 95-98. Tam V, Knowles SR, Cornish PL et al. Frequency, type and clinical importance of medication history errors at admission to hospital: a systematic review. Canadian Medical Association Journal 2005; 173: 510-515.